A letter recently appeared in the Sevenoaks Chronicle from David Terry appealing for information regarding his grandfather, Herbert William Terry. David referred to an article, which I had seen, regarding his grandfather which had been printed in the Chronicle during the war and later reproduced as a ’75 years on’ item in the 1990s. Other than that I knew little about Herbert and so emailed David to see if he had any further information and if I could help him in his research. Luckily David has family photos and newspaper clippings that helped us reveal Herbert’s story and research revealed that Herbert’s service papers had survived intact and I was able to send these to David. Herbert was born in Sevenoaks in 1887 to Arthur Jasper Terry (1861 – 1916) and his wife, Margaret Eliza nee Spavins (1857 – 1946). The 1901 census shows the family living on Hartslands Road with Arthur working as a gardener and thirteen year old Herbert described as a ‘cyclists boy’, possibly for the Post Office. 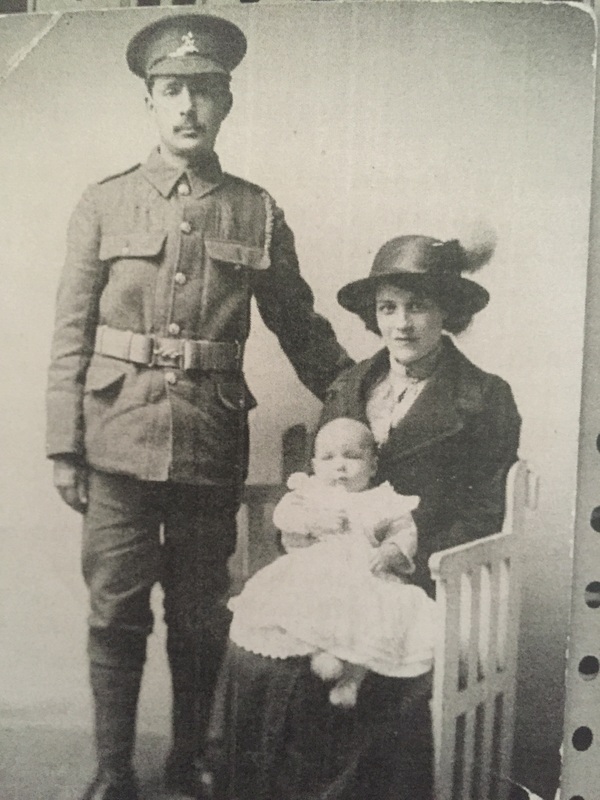 Herbert was twenty seven and working as a gardener when he enlisted shortly after the war began at Maidstone on 7 September 1914. His service papers show that he was 5ft 6 ½ with a dark complexion, blue eyes and black hair. He initially joined the 7th Battalion, Royal West Kents and was later transferred to 9th Battalion in July 1915 and then in August of that year to the 8th. Herbert had married Mary Maria Mercer (1894 – 1966) in early 1914 and his first son and David’s father, Arthur Bertram Mons Terry, was born later that year, to be followed by five other children. ‘For conspicuous gallantry and devotion to duty. He was one of a party which entered the enemy’s trenches and captured two prisoners. He has continually done excellent patrol work and has set a splendid example of courage and good leadership during a long period’. Some months before this on 24 July 1917, Herbert sustained a shell wound to his left leg, which was subsequently amputated. 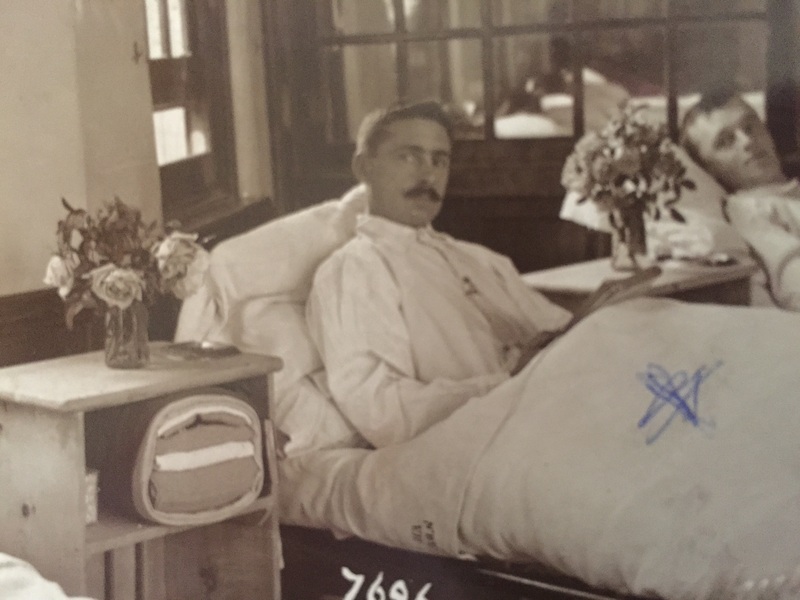 Herbert spent some time in a hospital in St Albans recovering from his operation and was honourably discharged in September 1918. ‘with 80 copies of the war communique to write out in between the passing of air-raid warning messages to exchanges and civil defence units throughout the area’. Herbert enjoyed a long retirement and died in 1976 aged 89 and is buried in Greatness Cemetery. If any reader remembers Herbert or his family, I know that David Terry would be very interested to hear from you.